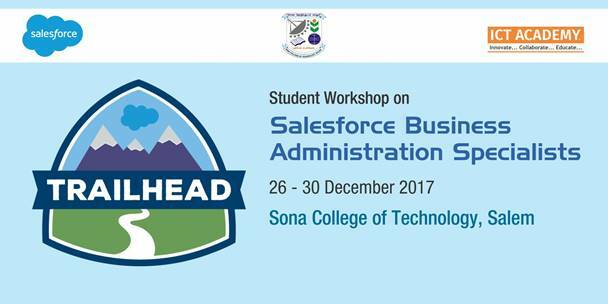 SalesForce, World’s No.1 CRM Company in collaboration with ICT Academy conducted “Salesforce Business Administration Specialists” student workshop during December 2017. Among the 100 institutions who have participated in this workshop from across India, Sona School of Management, Salem has been selected as the top performer. The performance is based on students score (super badges) in the assessment. This workshop is a value addition and skill enhancement for our students in the area of Marketing. On this achievement, Salesforce recognized with a certificate of appreciation during the ICT Academy – Salesforce Academic Summit 2018, scheduled on 8th May 2018 (Tuesday) at Hotel ITC Grand Chola, Chennai between 9.00 am and 5.00 pm. And our Director, Dr. Swarup K Mohanty, received the award.